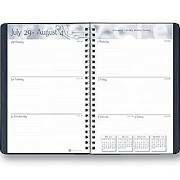 The Reporter’s Diary is wide ruled heavy stock with room for over 25 appointments on each page. The diary is spiral bound made with a heavyweight cover. It lies flatly when open and great for photocopying.